Optimized SocialEngine Hosting For Social Network Websites. We'll register a new domain or transfer your existing domain free of charge with all SocialEngine hosting plans. Switching to us is easy! We'll move your entire SocialEngine website from your current host hassle free. Host unlimited individual websites on all of our hosting plans. Install multiple instances of SocialEngine with ease. FFmpeg video and audio conversion modules come pre-installed so you can setup your SocialEngine community website without having to install any codecs. Our CSF firewall will protect your SocialEngine website from login attempts and other malicious activity. We host thousands of SocialEngine websites and can help you navigate SocialEngine if you need a hand. We're sure you'll love our SocialEngine optimized hosting but just in case we'll give you a full refund within 30 days. Install and Launch Your SocialEngine Community Site With Us Today! We Host Thousands Of SocialEngine Websites With Hosting Plans Literally Designed For SocialEngine. 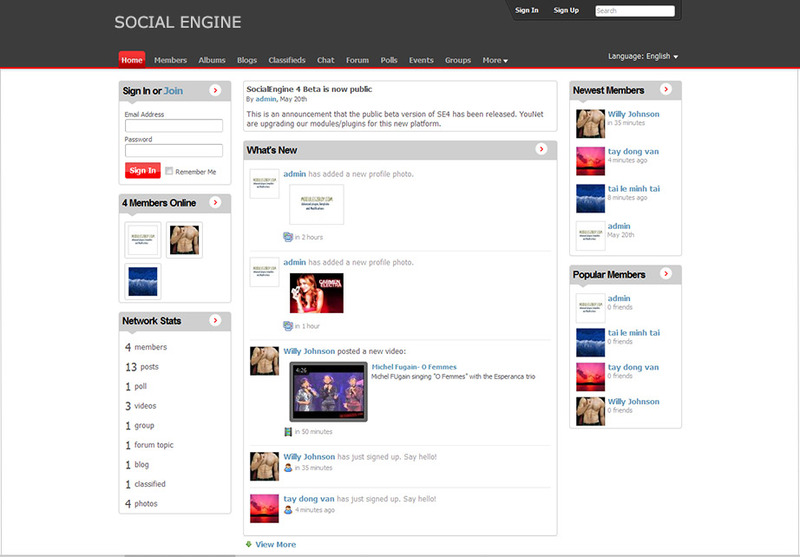 SocialEngine is PHP community software that helps you build your own custom social network website. Advanced social networking features include blogs, videos, audio, wall posts and tons more. SocialEngine is a paid script that works perfectly with HostUpon's SocialEngine optimized hosting plans. Can I use any SocialEngine Themes or Plugins I want? Yes! Our SocialEngine hosting plans are compatible with ANY theme or plugins you plan to use. Whether it's a free or paid theme it will work 100%. Can I upgrade between SocialEngine Hosting plans? Yes, you can switch between hosting plans at any time and our prices are pro-rated meaning you simply pay the difference of the new plan. Upgrades are instant between SocialEngine hosting plans and there is no downtime. Can you help me install my SocialEngine theme? Yes, for a small one-time fee we can setup, configure and install your SocialEngine Theme. Simply submit a support ticket and our techs will explain the process. How do I Install SocialEngine? Once you've purchased your SocialEngine software from their website you'll be provided with instructions on how to install it on our hosting servers. We offer installation services for a small one-time fee. "We have a Graphic Design Community we're hosting with HostUpon using SocialEngine. They've been a pleasure to work with from start to finish. We launched our community just 6 months ago with the help of HostUpon and John from support was fantastic. He explained our options and even gave me a quick tour of the cPanel. I'm no expert but John really went out of his way to help us launch our community and I'm forever grateful. Thanks for your amazing support and expertise, you truly made a lifetime customer out of me :)"